Our Practice - Michael Ringel, O.D. Thank you for taking a few minutes to become acquainted with my office. My goal is to provide you with the best eye care experience possible. We strive to accomplish our goal by providing you with personalized attention from the moment you arrive. Meet the Staff. Why did I choose optometry? I became interested in optometry when my grandparents suffered vision loss in their later years. My grandmother developed a retinal detachment and both my grandmother and grandfather were diagnosed with macular degeneration. At that time there was very little that could be done to improve their eyesight. Today we can preserve one's vision despite this diagnosis. My close high school friend and college roommate always wanted to be an optometrist. He told me more about the profession and I decided to shadow an optometrist in my community. Once I spent time with this optometrist I knew the profession was a good fit for me. 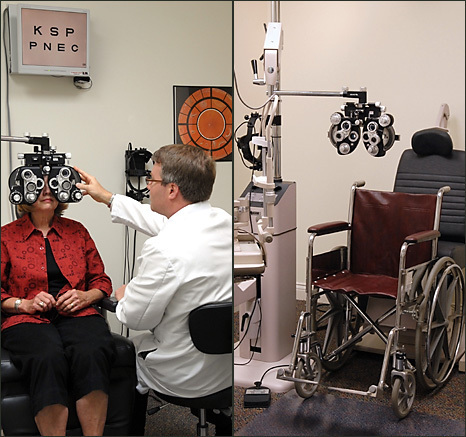 Now I get a great deal of satisfaction helping patients just like my grandparents with their vision difficulties. Dr. Ringel's office is equipped with the latest in examination equipment. He uses computerized instrumentation to assist him with measurements and diagnosis of your ocular status. 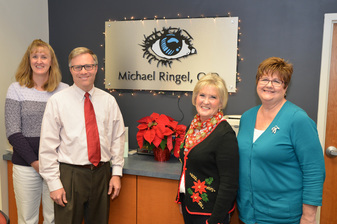 Dr. Ringel takes great pride in providing accurate prescriptions. One of the examination rooms is equipped with specially modified instruments to allow a person in a wheel chair to remain in that chair. This greatly reduces the need for multiple family members to accompany the patient.